Moses Kiptanui, one of most successful runners in Kenyan history, claims doping is rife among athletes there. The three-times 3,000m steeplechase world champion and coach alleges many athletes use performance-enhancing drugs as a shortcut to wealth. "The information shows that there are a good number of athletes out there who are using drugs," said Kiptanui. But David Okeyo, secretary-general of Athletics Kenya, said Kiptanui should provide evidence to back up his claims. Okeyo also called on the 1991, 1993 and 1995 world champion to name names. In a BBC interview, Kiptanui, 42, said: "They want to get money by all means. Either by a genuine way or another way. "We have put rules in place. If we don't use these rules then athletes will still use these drugs." Kiptanui also alleges widespread corruption around the world. "If you can bribe somebody today or tomorrow, then it [a test result] is gone," he added. "All over the world there is corruption in sport. "It is not only a matter in Kenya." 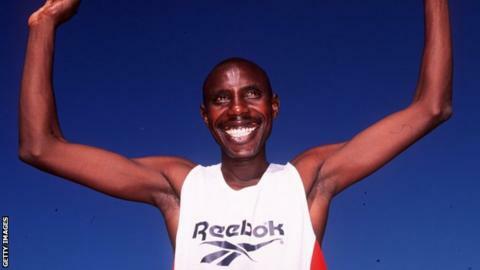 Last September, Kenya's athletics authorities revealed they were investigating allegations of widespread doping. The investigation was launched after media allegations that doctors had given banned substances to runners at a high-altitude training facility. More than 40 leading Kenyan athletes were subjected to out-of-competition blood tests after a team of overseas drug-testers paid an unannounced visit to the Rift Valley base. It followed reports in November that the World Anti-Doping Agency expressed frustration at a lack of communication from sporting authorities. In June, distance runner Mathew Kisorio failed a drugs test at Kenya's national championships and claimed doping was commonplace. Athletics Kenya head Isaiah Kiplagat said at the time that most athletes were "clean", but that he took the claims seriously. "We are carrying out an investigation," he said. "We are working with other authorities to ensure that... if this true, [we can] then take action appropriately on the culprits."